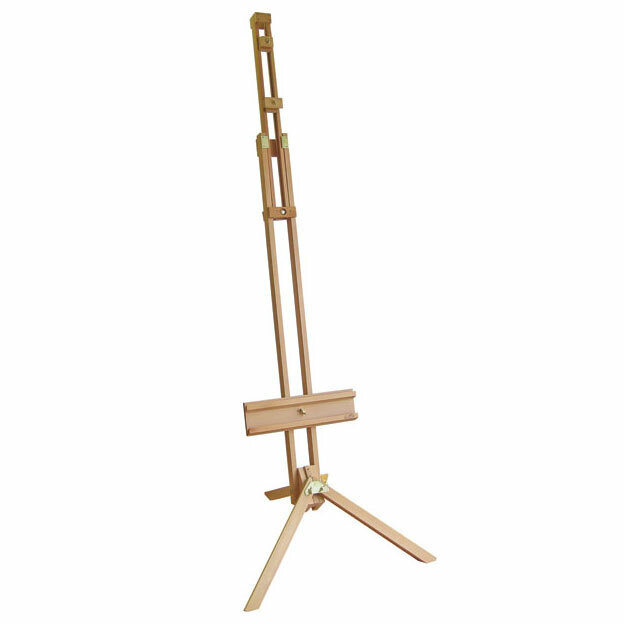 This robust radial easel is constructed from seasoned Beechwood and is designed to hold very large canvases up to 1.9m in height. Taking up very little floor space it is ideal for studios and colleges. The painting angle can be adjusted from a forward to backwards tilt. An extra canvas holding block can be used for displaying a reference picture or study above the canvas. The legs fold in against the easel when not in use. I bought this easel for my room while I was training at university. It takes up very little room and is very strong and robust as it is made from solid beech. The design is incredible as you can fit pretty large canvases onto it but it also folds away into a compact linear structure which can be stored in a cupboard or under a bed. I use it almost every day and it hasn&#039;t let me down yet.